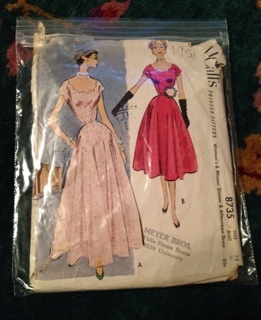 So, I was casually scrolling on the Facebook yesterday, and saw a post by We Sew Retro about a version of Simplicity 1795 done by Miss Allie Mass. Well, her version looked so nice, and the pattern seemed pretty simple/straightforward, so I immediately sought out a copy via Etsy. Gorgeous! I want one, too! 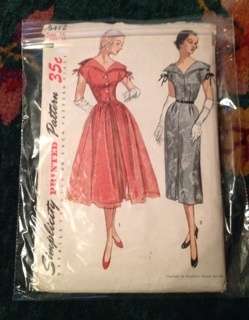 As some of you may know, vintage patterns on Etsy are in pretty high demand, or at least the people selling them think they are, so the least expensive copy (which was a size 12) was about $20 including shipping! 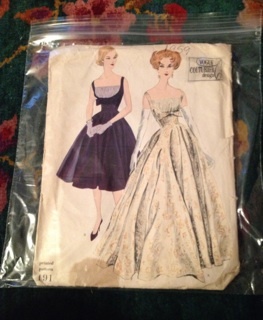 (I still have to buy the fabric and make the dress, geez.) 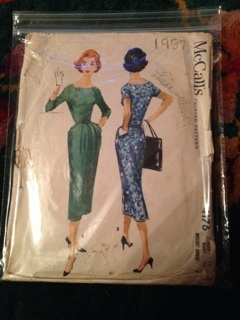 Instead of paying monies, I thought to myself, I’ll look through Mom’s stash of older patterns and just see! 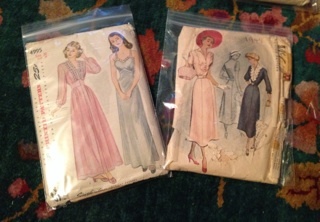 These patterns are mostly from the 40s and 50s, and belonged to either my Aunt Donna or Great-grandmother Wade. Quelle suprise! Turns out, we totally DO own it! AND it’s a 14! Minimal re-sizing = Success! Such a pretty, feminine scalloped edge! A contrasting interwoven ribbon?! Yes, please! This one is a particular favorite of mine! 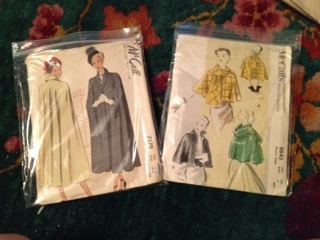 The sleeves and the collar are so pointy! Some subtle tucks at the neckline make this simple dress more fabulous! 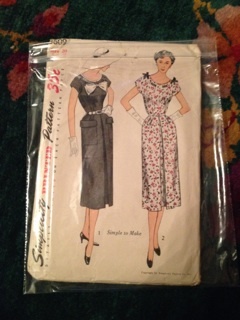 This is an earlier, 1940s pattern, and is clearly a day dress, however, the triangular accent on the neckline adds pizzazz and uniqueness! 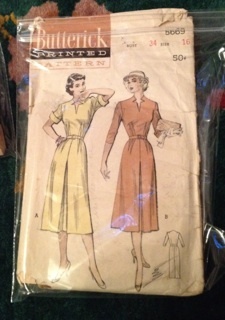 This dress has an angled, button front! SO COOL! 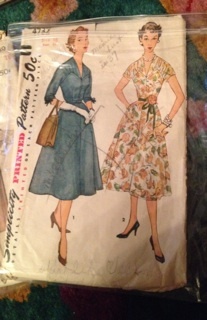 I will have a dress like this, since essentially having two skirts is even better than a peplum! Suspender-skirt is ADORBS! 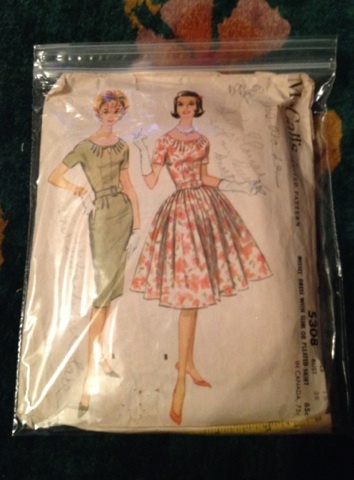 Plus, a classic circular skirt, with some super cute (and slimming) bow accents! Cannot wait to elegantly lounge in this! We’re having a hat making party, y’all!!! To wrap it up, two of my favorites, the first because it’s hilarious, and the second because it couldn’t be more fabulous! We’re gonna need to schedule a tupperware party ASAP. 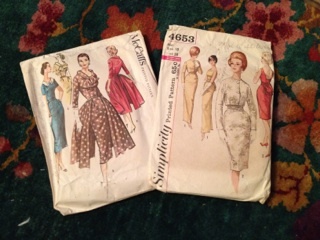 One of my favorite activities is going through vintage patterns for inspiration, and this Sunday was a complete success without even leaving my house! 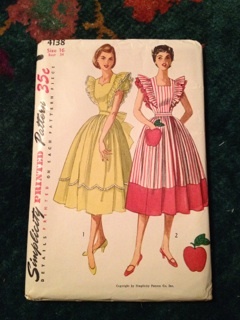 I am hoping to maintain this excitement into actually producing several of these dresses. Despite the insane amount of time and fabric some of these patterns require, I think the final products will be amazing! 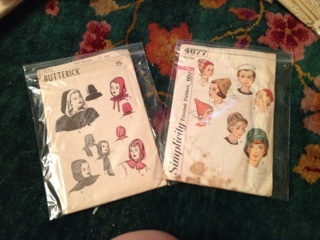 Plus, even when I work on a simple pattern, odds are that I’ll be learning at least one new technique. 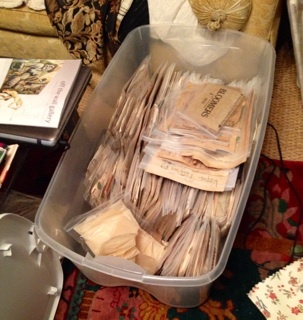 There may be time between now and New Year’s Eve to make one! Here’s hoping! Any suggestions about which one I should start with?? Which is your favorite? 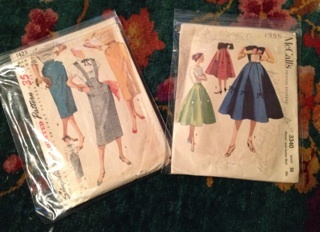 Do you like vintage sewing patterns? From which decade/era? Do you have a collection? Where’s your favorite place to purchase? Previous Post Re-purposing A China Cabinet for Jewelry Display! 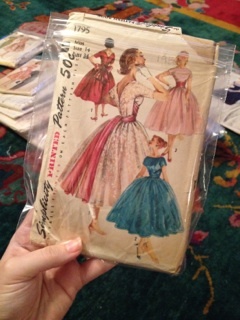 Next Post Random Fun Wednesday – Vintage Style, Hair & Ads!